Not that long back, a friend of mine came over for dinner. She rode a bike. It was cold out. No. It wasn't just cold, it was COLD. And not only did she ride a bike, she rode it, but wasn't wearing a hat under her helmet. Well, that just won't do. Cold ears are the worst! It didn't take long for Ravelry to help me find just the thing for her. 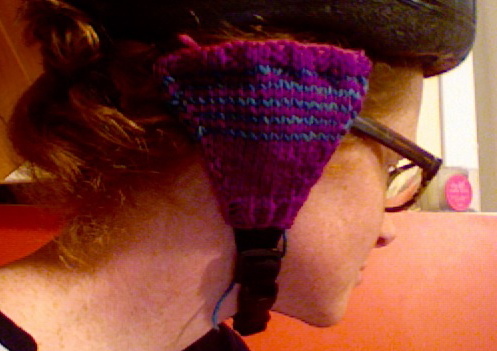 Bike helmet earmuffs! That way if she doesn't want to wear a hat under her helmet, she doesn't have to! But at least hopefully, her ears can stay warm. Okay. You know me. I didn't totally follow the instructions knit for knit and purl for purl, but I did base them off of this pattern. I added a button to be attached above the clasp so that the earmuffs won't fall down while biking. That would totally defeat the purpose.